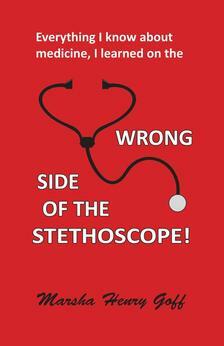 Everything I know about medicine, I learned on the Wrong Side of the Stethoscope is now available in print on Amazon or order from your favorite book store. Click on the cover to buy or read excerpts from the book. The book is also available on Kindle for only $3.99. It is a practical, informative and entertaining guide to navigating health care. Read it before you need it! Click on covers to enlarge. Click HERE to purchase or read more about this book. Available now on Kindle. A Crazy Plan: Darby's Rangers' Heroic Last Stand at Cisterna is the story of one of WW II's most heartbreaking battles, told by those who fought it. Only eight Rangers out of two battalions escaped; the rest were killed or captured. The book is quite short, but it contains information that has not previously been available. I originally planned for it to be longer, but one of the Rangers I interviewed was very ill and I wanted his story out there while he was still living. RIP Carl. They thought I was bluffing . . .
Well, sure, this is a facsimile, but I have received multiple $200 gift cards from Direct-TV after I followed through on my promise to change to Dish if they wouldn't meet their offer. If only Direct-TV had tried half as hard to keep me as they’ve tried to get me back! They certainly had their chances. I guess they thought our 21 year marriage was solid. When we built our house on a hill in the country, cable wasn't an option. We paid $1,200 for the D-TV satellite and Ray installed it himself while standing on a wooden ladder in the bed of his pickup truck to give him the extra height needed to reach the highest peak of our house. In less than a year, the satellite and installation were free with a contract. My marriage with D-TV had its ups and downs, as all marriages do. Technical assistance almost broke us up several times. After one frustrating call, I wrote a column about it. Want to read Boondocks living means no cable television? Click HERE. But what really broke up our union was the doubling, tripling, quadrupling of our bill. Enter DISH, a suitor that brought with it a really good deal, both price-wise and feature-wise. I called D-TV several times trying to negotiate a better rate. They wouldn't budge. So I am currently in the middle of a sizzling romance with DISH that is going very, very well. Hopefully, when this contract ends, they won't jack up their prices a la D-TV. Attention DISH: I love you now, but I'm clearly fickle about satellite providers when it comes to my pocketbook. You'd be wise to remember that. Full cover, back (left) and front (right). Click on photo for larger image. 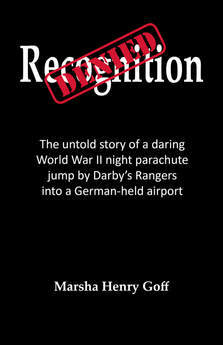 As a Christmas present to all of you — especially Rangers of any era and those who love them or who love history — you may download free on Amazon an electronic version of my short little book Recognition Denied beginning Saturday, December 23 through Wednesday, December 27. 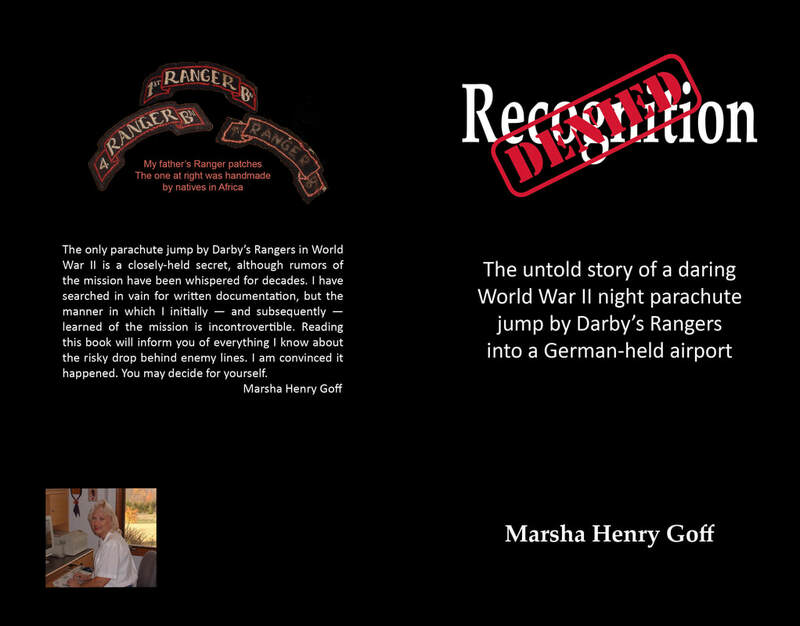 The book is the untold story of a daring WW II mission by several Darby's Rangers which is still unacknowledged by the Army. I believe it happened because of how I first, and subsequently, learned about it. Decide for yourself whether I proved my case. 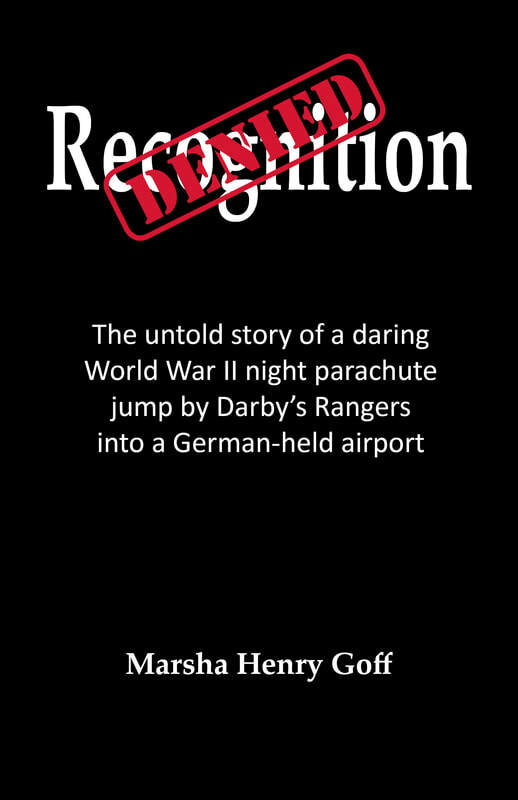 For a few brief days after publication, this little book was Amazon's Number 1 best seller for short history and Number 2 for WW II history. The men — one of whom was my father — are likely all long dead. The ones whose names are known certainly are. Here are the links I promised to a couple of past Christmas columns: ClickHERE for Charlie Brown Christmas and HERE for Beloved Pets. And, because it is nearly Christmas, two more: Click HERE for Ghosts of Christmas Presents Past and HERE for Shopper crying Wii Wii Wii all the way home. Have a blessed Christmas everyone! One of the best things about being a writer is that I get to meet some amazing people. However, I (and Ray, too) have rarely bonded with an interviewee like we have with Katie, a real-life World War II Rosie the Riveter. 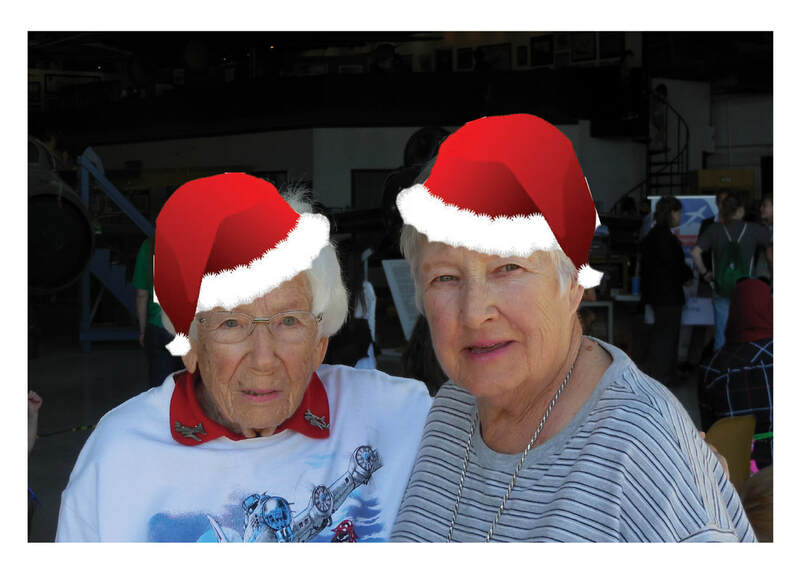 Katie is the youngest 96-year-old you’ll ever meet and her friend Pat, with whom she lives, is a vigorous 84-year-old. Together, they are a dynamic duo, endowed with energy, enthusiasm and humor. 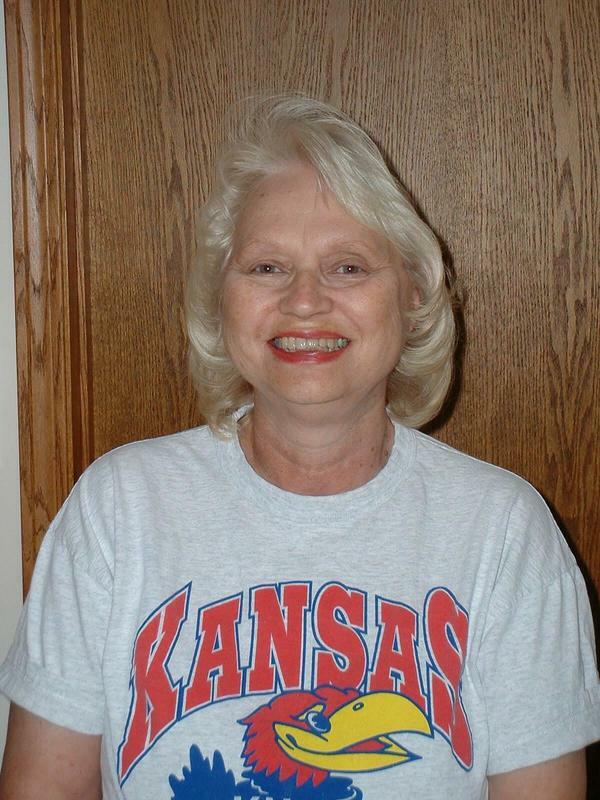 They are such avid KU Jayhawk basketball fans that Pat long ago painted her barn a vivid blue. That barn has been featured in a number of cards I have sent them and when Ray and I wanted to give them a Christmas gift, we decided to give something no one else could: a 2018 calendar prominently featuring the blue barn. ​In January, the barn hosts Pat and Katie’s “Rockin’ New Year’s Eve.” In February, it is a tunnel of love and it is the venue for an Irish Extravaganza in March. Bunnies paint Easter Eggs in front of the barn in April, Pat and Katie present a spring festival in May and own a garden center housed in the barn in June. They sell fireworks out of the barn in July, have a back-to-school book sale in September and in October, turn the barn into a haunted house. Pat and Katie boast a turkey farm in November, tagline: “We raise ‘em; you roast ‘em.” In December, they present Santa’s workshop for kids of all ages. But we knew Pat and Katie would love most that the barn turns into a theatre in August, starring nephew Brad Zinn, a talented comedy impressionist in his one-man show called The Great Comedians: Those Felt Hat and Big Cigar Funny Men. Katie and Pat are button-busting proud of Brad and think he is the greatest of performers. If you want to judge for yourself how good he actually is, click HERE. For 15 years, I wrote a humor column titled Jest for Grins for my local Lawrence, KS JournalWorld newspaper.While I stay busy with speaking engagements, writing articles and books and serving as editor and primary writer of a newspaper for a nonprofit agency, I really miss writing about the funny things life throws my way. This website allows me to do that. I freely admit to being a control freak who wants to do things on my own, but my new friend Ruth has been a tremendous help to me. I kept trying to make this website perfect before publishing, but finally decided that was like waiting to have children until you can afford them: it will never happen. So here it is; you'll get to watch it improve. If you develop into a frequent Jest for Grins visitor, you'll quickly become familiar with my usual cast of characters: husband Ray, sons Ray, Jr. (aka Butch) and Greg, daughters-in-law Linda and Valerie, grandchildren B.J., Gabe, Sammi and Zoe, sisters Lesta, Bette and Vicki, as well as a host of family and friends (not one of whom is boring). If the topic has the potential to be embarrassing to them, be assured that they read it and gave it their OK (otherwise, sister Lesta has threatened to sue me).